Our guide Gerry was terrific he introduced us to so many different foods,and so informative great day. Tour was amazing. We tried a range of dishes and drinks. Gerry has a wealth of knowledge and was able to answer any questions. I highly recommend to do that excursion! You will test interesting and tasty local food and will know a lot of new. We would like especially dim sum, satay and bak kwa. Bak kwa we have tasted first time and even come back next day in order to taste again! Gerry and Jo have been so attentive and kind hosts! We even got food presents from them! And also it was plenty interesting information about everything: food, culture, country. Thanks, thanks again! It was just ok. Guide was good. This tour was fantastic. Wish we had done it earlier in our stay. Great to try so many different foods and drinks. And to find your way around China Town. We were able to go back the next day by ourselves and know our way around. We had so much food to try, very generous serves. We were a group of 6 and couldn't eat all the beautiful food. We even had to say no to dessert!! Gerry was so knowledgeable and good fun, as was his wife Jo. If you are only going to do 1 tour in Singapore, make it this one. Thanks Gerry! A great experience with Gerald providing some great local info on Singapore as a whole - on the food side he took us to Little India on our request as we had visited Chinatown ourselves the day before and we visited some great eating places and tasted some fantastic food with the locals which I am sure we wouldn't have done on our own. A great experience that we would thoroughly recommend - also great to be just us and G...... really made our trip to Singapore! Great evening out with Gerry Tan, good food, good company and an evening packed with surprises and entertainment. Gerry gave a great background to our visit explaining the local cultures and customs behind the food we sampled. 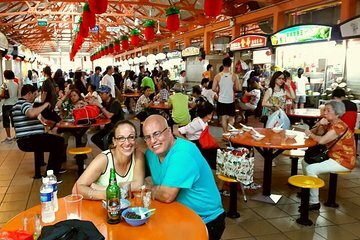 Great selection of dishes and many that we would not have attempted without Gerrys expertise in selecting well prepared food in the hawker centres which are a maze of delights. The paired local beer sampling was very welcome and the surprise Chinese New Year ceremony to end the evening was a delight. See you next time we are in Singapore Gerry.